Centaurs are typically depicted as fierce but loyal warriors. 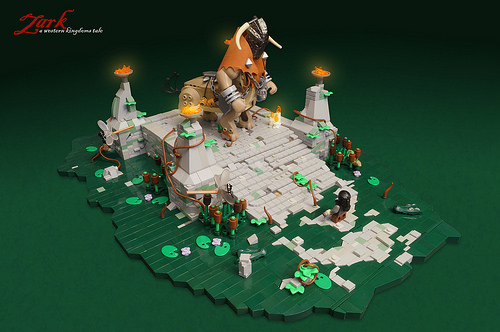 This take on the mythical creature by Dr. Zarkow is most certainly fierce! Aside from the frightening helmet and the string of heads hanging from his armor, the size of the beast is truly intimidating. To add to the other-worldly feeling, check out the dragonfly in the foreground. The crocodile top jaws emerging from the water are a nice touch. And speaking of water, it blends in perfectly with the background. 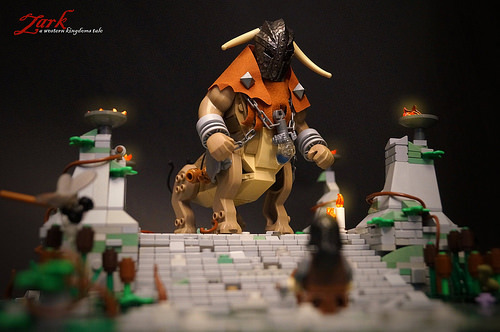 This alternate, “minifig-eye-view” shows just how imposing the centaur really is!